The Joint Prisoners of War, Missing in Action Accounting Command (JPAC) keynote speaker for the annual National POW/MIA Recognition Day Ceremony, Friday, September 21, is retired Col. William S. Reeder, US Army. 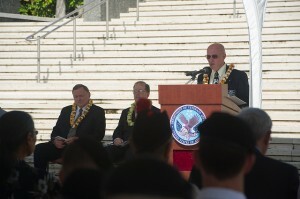 A former Vietnam War POW, Col. Reeder is among 400 JPAC personnel and invited guests attending the event at the National Memorial Cemetery of the Pacific in Honolulu. Col. Reeder’s AH1 Cobra attack helicopter was shot down on May 9, 1972, during the Easter Offensive in the Ben Het area of the Central Highlands. Thought to be an MIA, Reeder’s POW status was not known until his release a year later. Col Reeder, a Captain at the time, sustained multiple injuries from the crash, including a broken back and tried unsuccessfully for three days to escape the enemy. I encourage anyone reading this post to visit www.pownetwork.org/bios/r/r090.htm. Col. Reeder has written a moving story about a South Vietnamese A-1 Skyraider pilot, also shot down and captured, who saved his life during a tortuous journey on foot to prison. Although the story is not pretty, the ending is beautiful. The evolution of the National POW/MIA Recognition Day began on July 18, 1979, to honor America’s Prisoners of War and Missing in Action (POW/MIA), following the conclusion of the Vietnam War. It was largely a Washington, D.C., event, involving Congressional resolutions, a ceremony at the National Cathedral, and a Missing Man formation, flown by the 1st Tactical Squadron, Langley AFB, in Virginia. The Veterans Administration created a simple poster with the letters POW/MIA. Enter President Ronald Reagan in 1982. So moved was he by a new POW/MIA flag, inspired by Mrs Michael Hoff, an MIA wife and member of the Nat’l League of POW/MIA Families (League), President Reagan placed priority on achieving the fullest possible accounting for Americans still missing from the Vietnam War. Other than “Old Glory”, the League’s POW/MIA flag is the only flag ever to fly over the White House, having been displayed in this place of honor on National POW/MIA Recognition Day since 1982. By 1984, National POW/MIA Recognition Day was elevated to White House level — literally, inspiring a renewed commitment to honor all returned POWs and to renew our national commitment to account for, as fully as possible, those still missing from past wars. The dates and some of the ceremonial traditions have changed since the early days – growing in magnitude — the League moved for the day of recognition to be observed annually on a date not associated with any particular war or League event. Today, National POW/MIA Recognition Day is observed throughout the United States and around the world on the third Friday in September at our military installations, aboard ships and many other state and local areas throughout our nation. Flying the POW/MIA flag on Recognition Day has also become a part of this annual observance. Nowadays the POW/MIA flag is fast becoming one of the most recognizable symbols of the sacrifice that these special military heroes have given for our country – in many cases, the ultimate sacrifice. 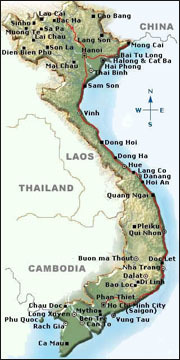 The starkness of the black & white flag is a reminder of the dark days endured by our POW/MIAs, and the prominent silhouette is a striking remembrance of their pain, not knowing when or if they would be reunited with families – many of whom did not know that their loved ones were imprisoned in a harsh environment – in the case of my generation, the jungles of Vietnam and Laos or the tough desolation of the now infamous Ha Long Prison (Hanoi Hilton) and elsewhere. Many families still grieve for the loss of their husbands, fathers, sons or brothers, left behind on former battlefields, wondering if they will ever come home for a proper burial in the United States of America, for which they gave so much. Vietnam War families, like mine, have never forgotten their loved ones. My first husband, Capt Jerry Zimmer, USMC, has always been a hero to our family, friends and many guys who served with him in Vietnam. 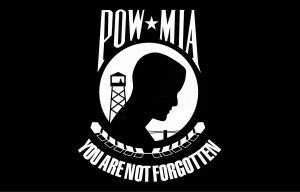 To me, the four words emblazoned at the bottom of the POW-MIA flag – “You Are Not Forgotten” – are a reminder of our Patriotic duty, regardless of the war that is nearest and dearest to our hearts, to never forget those who sacrificed their lives and suffered great indignity so that we may enjoy our freedom. Tags: 3rd Marine Aircraft Wing, Ann Mills Griffiths, Beatrice Zimmer, Brett Davis, Capt Jerry Zimmer, usmc, Col Jack Gagen USMC (Ret), Craig Zimmer, DASD Que Winfield, DoD, Doug Reese, DPMO, Dr. Tom Holland, F4 Phantom, Gene Mares, Jessica Tavasti, Johnie Webb, JPAC, JPACs Central Identification Lab, Leatherneck Magazine, LTC Patrick Keane, National POW/MIA League of Families, PACOM, POW-MIA Family League, Ron Davis, Ron Ward, TBS 1-67, TBS 6-67; TBS 4-67, USMC, VFW, VMFA-542, VVA. This entry was posted on Wednesday, September 19th, 2012 at 2:27 pm	and is filed under Honoring Our Military. You can follow any responses to this entry through the RSS 2.0 feed. You can leave a response, or trackback from your own site.